Tragedy and Compassion – two words that we don’t normally associate together. 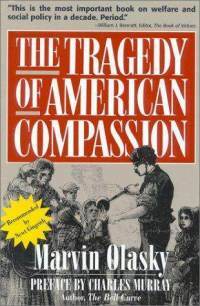 How could compassion be tragic? While we likely have different levels of bad news in mind when think of tragedy, we are all in agreement that tragedy is bad and something ought to be done. Although I think the TV news industry is working hard to widen the definition to include hangnails. Compassion is a bit more complicated. We tend to think of compassion from the ame perspective that we think of love – the unbiblical, Greco-Roman emotional view. Americans view compassion today differently than we did 250 years ago. We want to “relieve suffering” but don’t stop to think about the proper way of doing this, or even if there is such a thing. There are some issues – life threatening, for example – for which rapid elimination of the threat is proper. But there are many life issues that are the accumulation of bad decisions for which there is no proper quick relief. We can look at G.W. Bush’s policy in the Middle East, thinking the solution there was to quickly implant democratic governments. People will not value the liberty a representative government of laws brings until they realize their need of it. Small children will not realize the value of math if mom tells them the answers rather than teaches and asks diagnostic questions. Biblical compassion is based on biblical love – wanting the best (as God defines it) for the person and to honor God. As we’ve been taught, good deeds must incorporate right motive, right method, right attitude, and right objective. So biblical compassion must be based on a biblical view of God and of man. Our goal is not to bail a man out – it is to set him on his feet, exposed to the gospel, equipped to provide for his family. It is this framework that Olasky has done a masterful work outlining in this book. The Puritans had a reformed view of man: he is depraved and will avoid that which is unpleasant (work) if at all possible. This perspective, encoded in the laws of the late 17th century, was evidenced by giving time rather than treasure, requiring “decent living” of those being helped, punishment for wrongdoing – which included slothfulness. A key attribute of this perspective was the personal knowledge and connection between the better-off and the poor. Works-testing was required, so that a man or woman who was able to work would be put to work in order to secure food and shelter. “This social policy was based upon the theological view that stressed man’s sinfulness, which only God’s grace could change.” (pg 10) Further, “nothing that could contribute to the breakup of families, or to the loss of the family’s central role as support of its members was encouraged.” (pg 11) So a three-legged stool of family, church, and neighborhood was in place. The goal was not equal treatment of all who were in need, but personal attention to each with the aim of building responsibility and morality. Poverty – caused by circumstances such a illness or death – was seen differently than pauperism, a lifestyle of living off others with no regard for personal responsibility. Ten causes of pauperism were identified: ignorance, idleness, intemperance (personal character), “want of economy”, imprudent and hasty marriages (circumstances), lotteries, pawnbrokers, brothels, and gambling houses (institutions). Last on the list were charities that gave away money too freely. A key aspect of being responsible toward the poor was trying to discern between those stricken by poverty and those trying to “game the system”. “Their goal was not to weed out people – for they saw all as created after God’s image, and thus very different from weeds – but to require self-confrontation” and admission of their need. “The poverty which proceeds from improvidence and vice ought to feel the consequences and penalties which God annexed.” No one, however, was left to starve. “Tough love”, as it was called not too long ago. “When anyone asked for relief, the appropriate deacon investigated in order to discriminate and beneficially assist the really necessitous and deserving poor.” Your deacons have studied this aspect of benevolence, and have been encouraged by Job’s view of this activity: Job 29:15 – 16: I was eyes to the blind and feet to the lame. I was a father to the needy, and I searched out the cause of him whom I did not know. These methods, motives, means, and aims resulted in changed lives. Those predestined by God to new life were saved, others found meaning in the moral goodness of working for their food. As cities grew and problems more evident, agencies emerged to take advantage of economies of scale. Yet “charity leaders believed that few would volunteer many hours each week of they did not see themselves as soul-savers and not just bread-providers.” (pg 30) In the mid 19th century, Charles Brace, who had hoped for political change to help poor folk, quickly realized that “high taxes that supported a corrupt city administration were part of the problem, not a road to solution.” (pg 31) Brace tried direct material distribution to needy children (bypassing families and churches) but learned “if you put a comfortable coat on the first idle and ragged lad who applies, you will have fifty half-clad lads, many of who possess hidden away a comfortable outfit leaving their business next day, to get jackets for nothing”. He learned that spiritual reform must go hand-in-hand with material reform. This Christian view of man and compassion took care of what modern folk have called “human debris” – those folk without normal capacities of thought or emotional relationships, which governments tend to put away. And while this country was in pursuit of this God-honoring perspective, Benjamin Franklin saw in London, in 1766, the destruction wrought by the British welfare act: “There is no country in the world in which poor are more idle, dissolute, drunken and insolent. The day you passed that act you took away before their very eyes the greatest of all inducements to industry, frugality and sobriety, by giving them a dependence on somewhat else than a careful accumulation during youth and health for support in age and sickness … Repeal that law and you will soon see a change in their manners. St. Monday and St. Tuesday will cease to be holidays“. In this country, such welfare was widely hated and seen for the danger it was. Charities continued to see two categories of deserving poor people – the impotent poor, who could not help themselves (due to age, illness, etc.) and the able poor, who could work and would be required to do so. Being poor carried some measure of shame, seen as a deterrent to the attraction of pauperism.